It may be strikingly beautiful, but will it strike? And if it does, what should you do? Potentially dangerous animals crawl, scurry, and slither along the desert floor. Learn about their habitats, reproduction cycles, feeding habits, and hiding spots. We'll tell you what to do if you are bitten, stung, or harmed by one of these potentially deadly creatures - but more important, we'll teach you how to avoid dangerous situations in the first place. 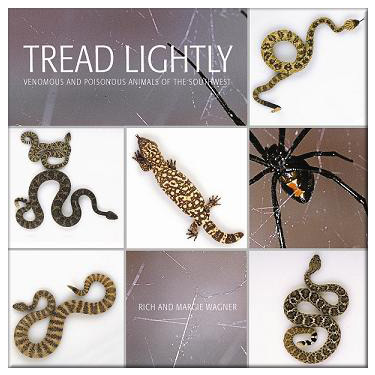 Great photos and entertaining to read, this book provides a wealth of information about venomous and poisonous animals, including rattlesnakes, scorpions, Gila monsters, tarantulas, black widow and brown recluse spiders and more. Also included are "look-alike" harmless animals that are often mistaken for their dangerous counterparts. 55 color photos.